Maybe this sounds like you…you’ve been “good” all week. Planning healthy meals, food prepping, and even making sure you have healthy snacks on hand all during the week. It feels like you are doing all the right things and putting all the effort in, but as soon as Thursday/Friday…Sat/Sun roll around, the will power is weakening, and chips and salsa, a big fat maragrita or an entire sleeve of Oreos has complete power over you. I’m 100% with you on this. It’s hard to keep a strict “plan” going, when really deep inside you’re feeling deprived from having those foods you really want to enjoy. Is there even any room for “treats” or “cheats” on a weight loss program? That’s all well and good, and we might have great goals, but something is missing. We are in the exact place we are right now because we’ve allowed that to be our standard. We let ourselves sit on the couch stuffing chips in our mouth and then we wonder why we don’t see results from our hard work. And when I was dieting years ago, I didn’t have room in my macros and calorie breakdown for the snacks I loved. So when I set out to become more balanced and live a lifestyle I loved with goals that were in line with how I wanted to feel and live, I really had to own that I love snacks. Most fitness professionals will claim that “food is just fuel” — but let’s be honest here…food is MORE than just fuel. There is an emotional feeling associated with food. When I eat Skittles, it makes me want to dance (well, yeah cuz I’m on a sugar high!) and when I eat mashed potatoes I feel so comforted and content. Foods mimic and trigger feelings, chemicals and neurotransmitters…so when we try to detach food from feeling it doesn’t work. Food has meaning. It’s directly tied to our social structure, celebrations, weddings, as well as moments of deep grief, like funerals. It can’t be separated from feeling. But we CAN become more aware that food is not the solution for the bad feelings and it is also not the only way to create good feelings. I used to get so upset when I would have “feelings” about food — like I should be more disciplined. But d@mnit! I love frozen yogurt with a ridiculous amount of cookie dough and that’s okay! So how do you reach a point where snacks, savory foods you love and sweets can be part of your life without dragging you down and stagnating your results? You have to earn the metabolism of an athlete. Or you have to be moderately active and be mindful of what you eat. I’m in favor of the former, because it makes me feel powerful, strong and like I can achieve anything. I’m for an exercise regime that keeps burning calories post-workout (known as HIIT training). And I’m all for doing it 5x a week if I know that I will have the ability to have that chocolate cake for dessert this week. In fact I never, ever look at it that way — like a trade off. And I don’t count calories. How I look at it is really by looking at my body and feeling my body. How does it look? Bloated? Fatigued? Dehydrated? Craving more and more junk? I start by bombarding myself with healthy foods. Water. Cut up veggies in low fat ranch. Brussel sprouts. And I load up on the water. Get more sleep. Commit to 5 workouts this week. Within that very first week I’m already feeling more accomplished and better about the direction my goals are going, and I’m already gaining momentum in my routine. Usually the time on weekends is a challenge because our schedules completely change and the structure goes away. And it can start right on the couch on Friday nights watching Netflix. A strategy I’ve implemented since reading The Compound Effect is to do chores right when I get home from work on Friday. A load of laundry goes in. The lunchbox and work bags get emptied. Dishes get put away and new ones loaded in the dishwasher. This whole process takes probably about 20 minutes, but it gets me out of the mindset of wanting to just veg on the couch, to actually doing something productive. 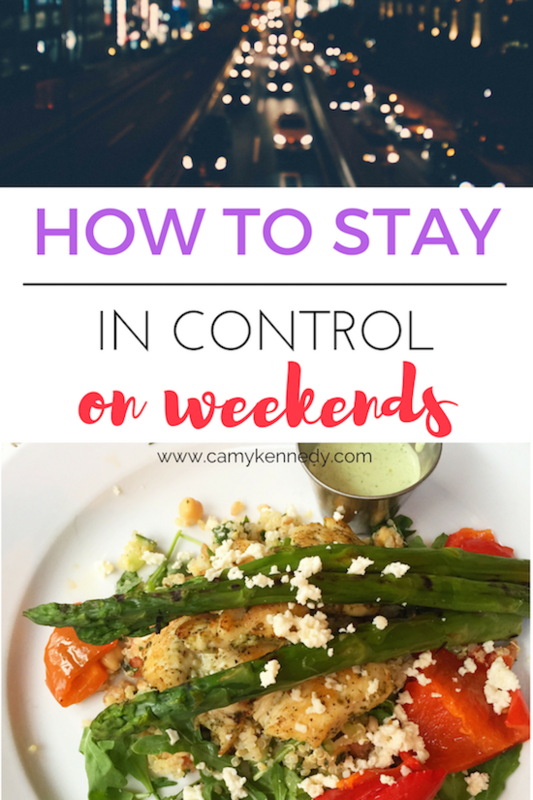 Here are some of the biggest struggles with weekend eating, and some solutions that I’ve used for myself and my clients. 1. Taking a walk helps with snacking mode. Or being productive doing household chores. 2. Adding more protein in throughout the day helps with cravings. As well as front loading your carbs so most of your carbs are midday or before. The best thing that I think can be done is to give yourself some grace. You will not become perfect overnight. But the next time you accidentally finished off an entire bag of tortilla chips, you can refer to this list and pick a strategy to prevent it from happening the next time. Lose the guilt and shame. You will get there. Persistence. Coaching. And a willingness to do the work to change the habits! [Reminder] TODAY is the last day to enroll in the Summer Body Challenge! It will be closing tonight (Friday, April 28th) at 9pm EST!